Aruna was born in Rajasthan into a Hindu family with strong roots in Eastern culture, lifestyle, tradition and beliefs. As an adult, she moved west, but she has kept the values, understanding and appreciation of the rich culture and heritage of her native India. Aruna started learning all the aspects of philosophy of Yoga (karma, bhakti, hatha) at a young age and has been practicing them ever since. For her, Yoga is and always has been a way of life. She has been teaching Yoga for over 3 decades. As a teacher Aruna is careful about the limits of your body, yet she is demanding, pushing you out of your comfort zone to a level requiring concentration. She is patient when explaining positions, and, using a gentle touch, carefully helps you correct the details of your positions and/or breathing. Her class routine is a sequence that begins with a thorough stretching of joints and muscles together with asanas and concludes with breathing exercises and a short meditation. 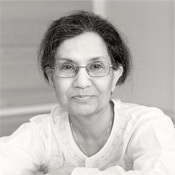 Aruna studied and taught at various Universities in India, US and UK where she specialized in Tropical Medicine. She was recipient of prestigious scholarships from Rotary International (US), Welcome Foundation (UK), NIH (US) and UNESCO (CR) for her post doctoral research. Aruna also has Master's degree in Indian classical dancing. All Aruna's lectures are in English. Jiří started studying Yoga in the 1970s in India where he gained an insight into the physiology of breathing and its influence on posture and inner stability. He further researched spinal and breathing exercises as preventive and therapeutic techniques for functional disorders. Jiří's unique approach combines classes on Yoga with principles of kinesiology (body motion and correct posture), occasionally using a skeleton and models to demonstrate and explain correct posture. His Yoga sessions start with a thorough stretching of the joints and spine, continue with asanas and conclude with a short meditation. 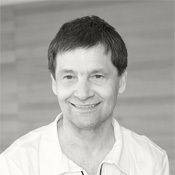 Jiří is the resident physiotherapist for the National Theatre Ballet. He also lectures students in the faculties of Dance and Physiotherapy at various universities and is asked to give lectures at distinct institutions around the world. All Jiří's lectures are in Czech.